"A fundamental principle of the Constitution is that Congress has the power to preempt state law. Even without an express provision for preemption, we have found that state law must yield to a congressional Act in at least two circumstances. When Congress intends federal law to ‘occupy the field,’ state law in that area is preempted. And even if Congress has not occupied the field, state law is naturally preempted to the extent of any conflict with a federal statute. We will find preemption where it is impossible for a private party to comply with both state and federal law and where ‘under the circumstances of [a] particular case, [the challenged state law] stands as an obstacle to the accomplishment and execution of the full purposes and objectives of Congress.’"
A federal district court in Oklahoma has also determined that where Congress is silent, "Rules of statutory construction dictate that the court should find the federal government exempt from the application of state statutes which attempt to regulate any collective bargaining agreement to which the federal government is a party." 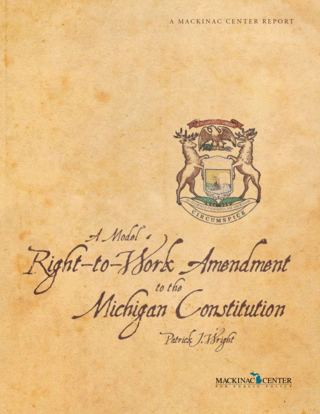 Further, the U.S. Constitution’s "commerce clause" gives Congress the power to prevent state right-to-work laws from becoming legally effective. For example, in Ry. Employes’ Dep’t. v. Hanson, the Supreme Court in 1956 held that a railroad union could enforce a security clause related to a union-shop agreement.† While recognizing, "Powerful arguments have been made … that the longrun [sic] interests of labor would be better served by the development of democratic traditions in trade unionism without the coercive element of the union … shop," the court held that the Railway Labor Act, which explicitly allowed union shops, trumped the right-to-work amendment in the Nebraska Constitution. ** Note that a state law or constitutional amendment that attempted to establish a statewide free market in labor relations policy would conflict with the NLRA’s provision establishing private-sector unions’ monopoly bargaining power and would be overturned in court. In fact, such a law would be pre-empted not only by the NLRA, but also by other federal labor laws, such as the Railway Labor Act.